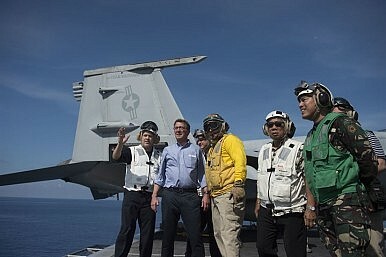 Defense Secretary Ash Carter and Philippine Defense Secretary Voltaire Gazmin tour the flight deck of the USS John C. Stennis in the South China Sea on April 15, 2016. Washington issues first public confirmation that patrols with Manila have already started and will continue. On Thursday, the United States finally revealed that it had been conducting joint South China Sea naval patrols with its ally the Philippines. As I indicated in a previous piece for The Diplomat, Washington and Manila had already been discussing the potential for such patrols, including at their “2 + 2” ministerial meeting this January in Washington, D.C., between their defense and foreign affairs officials (See: “Why the Philippines is Critical to the US Rebalance to Asia”). Indeed, when I asked U.S. ambassador to the Philippines Philip Goldberg about these joint patrols during the U.S.-Philippine Strategic Dialogue in March, he said that the United States announces those operations after they occur, not before (See: “A Big Deal? US, Philippines Agree First Bases Under New Defense Pact”). Sure enough, on Thursday, U.S. Defense Secretary Ash Carter publicly revealed for the first time while on a trip to the Philippines that U.S. ships had already been conducting patrols with Manila in the South China Sea. Carter disclosed this during a news conference with his Philippine counterpart Voltaire Gazmin. The first joint patrol, Carter said, was carried out in March, while the second was done in early April. Both Carter and Gazmin also stressed that plans were in the works for these patrols to occur regularly in the future. Carter also reinforced this announcement with a visit to a U.S. aircraft carrier in the South China Sea. Predictably, China said Carter’s announcement on the patrols, coupled with an enhanced U.S. presence in the Philippines and increased maritime security assistance, as further evidence that Washington is militarizing the South China Sea, with the implicit message that Beijing is merely reacting to the actions Washington is taking. In reality, joint patrols should be viewed as a consequence, rather than a cause, of Chinese behavior in the South China Sea. Chinese maritime assertiveness in recent years – which has included seizing Scarborough Shoal from the Philippines back in 2012 as well as repeated harassment of Filipino fishermen, vessels, and aircraft – has pushed Manila closer into Washington’s embrace, leading to developments unimaginable just a decade ago including the inking of a defense pact as well as a new maritime security initiative (See: “US Kicks Off New Maritime Security Initiative for Southeast Asia”). In this vein, as expected, Carter’s visit also included other announcements including more maritime security assistance, and further progress on the implementation of the new U.S.-Philippine Enhanced Defense Cooperation Agreement (EDCA). Meanwhile, Beijing’s assertiveness in the South China Sea shows few signs of easing. As I’ve noted previously, U.S. defense officials have already confirmed that Beijing has deployed a surface-to-air missile system and fighter jets to the Paracel Islands and has been building new radar facilities in the Spratlys. This week, Gen. Fan Changlong, vice chairman of the Central Military Commission, also visited China’s artificial islands in the South China Sea to observe the very construction work that has raised regional tensions, a move that could be a precursor for the violation of President Xi Jinping’s pledge not to militarize the Spratlys. There have also been renewed concerns about rising Chinese activity in Scarborough Shoal, a feature which has additional significance for both the Philippines and United States because of its proximity to military facilities. All this comes ahead of an upcoming verdict on the Philippines’ South China Sea case against China expected in May or June. The Diplomat understands that preparations are already being made by U.S. and Philippine officials for various moves Beijing might undertake after the ruling, which it has already said it will not comply with (See: “Does the Philippines’ South China Sea Case Against China Really Matter?”).